This is my third interview with maverick tech entrepreneur Michael Tobin OBE. We discuss how to get the most out of your work life balance or as he calls it work life integration. If you like the episode don’t forget to share and review us! Today, I’m interviewing MIchael Tobin OBE, and he’s actually the founder of the CEO sleep out, which is a really great charitable event that happens once a year in London. He’s an English technology entrepreneur, businessman and philanthropist. He was the CEO of FTSE 250 data centre operator called Telecity group. In 2014, he was awarded an OBE for his services to the digital economy in the Queen’s Birthday list, and I’ve always really enjoyed talking with him. He’s always been very generous with his time and I’ve learned a lot from listening to him and we’re going to delve into some really, interesting topics and I think you will love this episode. It is lovely to speak to you again Mike. Thank you very much it’s lovely to speak with you too! So today we’re going to firstly talk about work life balance. I know that’s a really big topic for you and you’ve got your kind of attitude towards it. It’s more of an integration isn’t it as far as far as you’re concerned? I think you know when you look at people that have tried to balance you know let’s call it work and life and I think about the great leaders of recent times and people like Nelson Mandela who was a great inspiration to me and he was such a great leader in his time. But at home he was a disaster and you know he was divorced twice his kids were either going over his legacy before he had even passed away. And I think, you know, that’s a typical example about when people are so focused on success in a certain element of their life, they feel that you know, they just cannot, they don’t even have time for the other part. And you kind of wonder whether that’s real success or not, you know, and once that appears to be from the outside, because you know, he changed the world to an extent, and, you know, people like Clinton, they’re, you know, they’re also great leaders. But again, home life, you know, let’s, let’s talk about it, it’s a mess, right? You know, if you think about it as an integration, then then you shouldn’t see a difference between work and life, right? You should, it should all be the same thing. And then you can actually put 100% into it. Because it is the same thing, you’re actually putting 100% into a combined environment, there’s a couple of examples. I mean, that I can I can give you, but then I talked about this a lot in my second book, actually called Live, Love, Work, Prosper. Which is all about how exactly how this work life integration is the way forward. But imagine I’ll just put it one specific way round in terms of male and female here, but it works either way. But let’s imagine that a woman’s young, young couple, young family, baby, the woman’s got a sort of mid management role. She’s looking for the next step on the ladder and desperate for that one promotion place that’s coming up soon, so that the, you know, the family can can prosper, and they can get the next house and so on and so forth. This is really, really important. So then the pressures on right the pressures on the the the executive, young young woman executive, to either decide between her fulfilling her home commitment to getting home and taking over bath time so that the husband can go out or staying and doing the work or at least doing the work at home, which you know, is is sort of conducive to her career progression. So, there’s a, there’s a conflict there between family and work immediately. Now, there was a report that a guy called Oliver James who was a clinical psychologist. I interviewed for the book actually. But he did a report and made a study of middle management at some point a few years ago. And he said, out of the people asked this question 74% of them admitted to line to their partners about working from doing work at home. And suddenly you’re lying to your partner but your endearing yourself to colleagues at work and you know, we we all know the risks of office office romance and everything else but you know that’s it. That’s a tricky slippery slippery slope to get onto. Now they’re all going to gather on the around the water cooler and you know, it’s it’s going to be a difficult one I mean, working from home is tough anyway you know, but it’s it’s very difficult for people in work especially if they want to achieve great things you know, whatever career they’re in I mean so what would you sort of recommend? I mean in that particular instance right you can come home and then you know you go straight to the husband and go “Good Lord and you know it’s just happened to me this this pain in the neck boss of mine you know look at the email he just sent me! I can say to him all right I’ll do the work and then you can call your guys and say you’re going to be 30 minutes late yeah right. So now instead of it being a kind of an opposition at home right and you’re siding with work against home now it’s like them and us is the home environment against the outside world. And then, you know, you can you can imagine, and that sort of situation where where the guy in this case understands the two dynamics, you know, to be fair, we probably do need that promotion. So why don’t you go ahead and do it? And I’ll find the solution with the last Yeah, right. So it’s really a different, it’s a really different approach. But, but it kind of it doesn’t drive the wedge between work and life, it drives the, you know, it makes sure that that, you know, there’s more of a collegiate view of both of those things. And that’s a simple example. But there are many other examples that they were in the book. Yeah, that sounds that sounds absolutely brilliant. It’s, it’s, it’s very similar to business management, isn’t it? Really, it’s kind of like my dad used to, used to manage, you know, quite a few people, and he would use the technique of sort of his would know what the solution was to the problem. But he would sort of say, Well, you know, we’ve, we’ve got a problem here, what, what do you think we should do? It’s a similar kind of thing, isn’t it? I suppose it is, I mean, you know, if you, you know, the difference between sort of leaders and managers today in business typically revolves around the fact that a true a truly great leader would simply have the role of creating more leaders around so. So the difference being a manager will say, do this, do this, do this. Now, quite frankly, if you employ the best people you can possibly find in each role, they’re probably better than you at their role. Why would you be telling them how to do it? So, you know, that the original, the sort of traditional view of a manager is like, everyone, I’m going to tell everyone to do this, and it’s more sort of delegation, well, there’s a different way to delegate, there’s a delegation of both responsibility and power rather than just responsibility, and you sort of say to people well look, you know, what we’re trying to achieve as an organization, and, you know, what we’re trying to achieve as a team? What do you think, in your, in your capacity as the most informed, educated person within your space? What do you think is the best route forward, and then you’re you’re giving, you know, you’re sort of engaging with people in a familiar way, and saying, you know, as a team, as it as a group here, “We’re going to go forward, and we co depend on each other.” As opposed to, you know, you’re all doing this stuff, and I’m going to get the glory. Yeah. And you kind of think of, you know, these, this, this point, which is, I think Ralph Nader was, was one of the early the early guys that kind of articulated leadership like this. But, you know, the only job you have as a leader is to create more leaders around you. And then, you know, that began this empowerment and my earlier book:- Forget Strategy, Get Results it’s a bit tongue in cheek. But “Forget Strategy, Get Results, really means don’t don’t apply so much of a prescriptive strategy to to life and business, but prescribe a vision. And the subtle difference between strategy and vision is that, you know, you can have a vision that is unwavering. But how you achieve that vision can can change second by second, minute by minute, day by day, because stuff happens around us that that doesn’t necessarily conform to a prescriptive order of things. So you know, from corsage said, in football, everything is complicated by the presence of the opposite team. And you, you can go go with a great strategy. And, you know, we’re going to go there, and we’re going to do this, and you’re going across the board. And from there under, but actually, unless you go until the other side in the changing room, exactly. Your plans, they wouldn’t know your plans, therefore, they’re going to do something to mess them up. Right, fittingly, you know, the opposition opposition always messes up your plans. And so, so having a sort of a prescriptive process of how to get from A to B, especially in this disruptive world that we live in today is not ideal. You know, we have to have a vision and then have amazing people around us that are flexible enough to an adaptable enough to take all of the changes that are happening on a on a second by second life sort of basis, and still flex to deliver that vision. And, you know, Darwin said, it’s not the biggest, or the fastest, or the strongest, or the, you know, that survive, it’s the most adaptable that survive. Its never more, you know, it was visionary for him to say it, but it’s, and he was only looking back over, you know, 10s of millions of years since, since dinosaurs. But actually, it is applicable today, even more uplifting today, especially in business, and then ever has been before because of the disruptive technologies we have around us. Well, I mean, you know, if you if you lived in France, they would be enforced going down, but I’m not sure that’s necessarily a good thing, either, you know, but if, but if we’re, if we’re in an environment where we don’t actually know this, we’re working, let’s put it that way. Right. Yeah, if we, if we, if we we love, you know, footballers, and you know, sports people, they love what they do, and they get paid for it. Yeah, never in a minority, obviously, across the globe. But, you know, if we can, if we can aspire to finding a role that we love, then it doesn’t feel like work when we do it. And therefore, we know, that allows us to, to integrate the concept of work and life much easier, because, you know, part of your life I mean, you often find people saying, you know, I could never retire because, you know, I wouldn’t, you know, I enjoy going to work and I enjoy the interaction, and I enjoy, you know, chatting with my colleagues and, you know, what, sort of stuff. Well, that’s because that becomes part of your life. Yeah, right. And, and if you take it away, you feel that your life is is lacking in something. Yes. You see a lot of people just not wanting to, to, to, to retire, you know, and that’s okay. Because they’ve got, they’ve got a great, you know, situation where they can get paid to live their life. Yeah, yeah, so, in terms of like outsourcing, right, I mean, I I, because I’m because I’m, you know, I’m obsessed with this Podcast. But I’ve got, I’ve got some other work that I’m working on at the moment. And so I’m sort of looking at outsourcing. So I was like, Okay, I’m going to, I’m going to study outsourcing. And I’m going to learn about how to make it work for me. So. So I listened to a listen to a podcast just today about it. I think it was like a Harvard Business Review. Or, you know, Harvard, something, rather, I’m not that I don’t mind Harvard. But my dad went to MIT this certain, my Grandfather so there’s a bit of light rivalry, I listened to it. And what they were saying was actually you should, you should, you should kind of look at the things that you really hate doing. So for example, I mean, we’re talking about work life balance. Yeah. And that’s what actually that particular Podcast was about was was sort of, you know, if you don’t like doing the washing, you need to think about, I mean, all right, you don’t want to put an hourly rate on your, on your, on your salary. But in your mind, if you if you work for a company, there’ll be an hourly rate in your head that you’re earning might be 100 pounds might be 50, it might be 20 might be, you know, 500, 1000, whatever. But that was what they sort of said in there. So it was like, then you can begin to think, well, right? What is going to make me happier now? Am I going to stay at home and do all the washing and cleaning and everything else? Or am I going to hire someone in an hour on a 10 pounds an hour or whatever, to come in and clean up my place? So that was kind of what that was about? And I found that quite interesting, actually. I’m going to make it into some game, I’m going to, you know, bring the kids in with it. And we’re going to, we’re going to throw each other the clothes in a long line, and they’re going to go in and we make a fun thing, right? So you see something that you that becomes enjoyable. If you can’t do that, which sometimes you can’t with relationship, sometimes it doesn’t work or, and so on and so forth, then you try to change it. So as you say, you know, if you look at your hourly rate, and there could be someone else that you can employ to come in and do your washing or they could you know, you we have a guy come around and pick up my dry cleaning on a regular basis. So, you know, that’s kind of the same thing. We’re outsourcing. Yeah, we’re changing the dynamic. We’re not doing it any more. Someone else’s, and therefore, I don’t have that dislike again. Yeah, that’s pretty much what that episode was saying. Actually. Then there’s a third thing, right? Because that’s not always easy. You know, maybe you can’t change a person, right? If you can’t learn to love it, and you can’t change it, then the action is leave it right. You walk away, you stopped doing it in the case of washing clothes. Well, you know, you if you if you’ve tried to do with the other things, and you’re still not happy, then then let’s not washing the clothes. Let’s buy really cheap stuff and just constantly buy new ones. more rapid wash again. But you know, in terms of people, you need to walk away from them. Yeah. Because, because if you’ve tried to learn to accept that dynamic, and that hasn’t worked, and you’ve tried to change that dynamic, and that hasn’t worked. The action is walk away or sit there constantly being unhappy. Yeah. said that’s not acceptable in life. Yeah, you’re wasting your life on that basis. Agreed? Agreed. So stress management, right? I mean, this, this, this all causes stress, doesn’t it? Like if something is out of shape? I mean, there are many reasons you can have stress in life, right? I mean, there are personal reasons, health reasons, financial work, you know, fulfilment, exercise, whatever. But like, it’s so closely related, isn’t it? That it’s super interesting work life balance and stress management. But one can cause the other, right? Because you’re, you’re chewing away, you’re gnawing away, and your stress level goes up, and all this sort of stuff. But actually, when you look at the future, there’s only two two things, right. So again, if you if you ignore the fact that doing nothing, then there’s either something you can do to positively influence the future, or there’s nothing you can do to positively influence the future. If there’s something you can do, then you should go ahead and do it, not worry about things, but go ahead and do it to positively change the future outcome, right! And if there’s nothing you can do, then don’t worry about it, either. Because there’s nothing you can do. So the concept of worry, right, is a completely outdated nonsense. And we that we have to be in a zone, a frame of mind to say, I’m going to deal positively influence it, or there’s nothing I can do to present that influences. Either way, worrying is not a solution. Why would we stress and why would we stress about dying? I mean, I’d say so why? Why should we stress about it? Now, people stress about that they, you know, they worried about dying? Well, you can you can do something to positively influence the future. In other words, you can do things that will prolong your life. But you can’t stop death coming. So don’t worry about the death bit focus on the positive. So trying to extend the life. Yeah, yeah. So when people, all right, so they got to start there, right? And say, well, is this something that I can do something about? Or is it not? Yeah? And then I just write it down and like, forget about it, and then I might come back to it the next day and go, I really must do that. It’s really stressing me out. And then I can get on with it. But some people, they will, they will just ignore it won’t let it eat away at them until it sort of gets on top of them. And then they get stressed out of their minds. And, and like, I have to go out and get fresh air because they’re out of their heads, you know, on the worry. Yeah, I mean, there’s, there’s a, there’s a lot of a lot of people that I know, you know, would rather do the ostrich strategy, right, which is the sand and wait for it to go away. But it doesn’t go when you know, on what rarely does. And so, you know, doing nothing as a strategy. Yeah, that that is an option. If you understand what you’re doing with by doing nothing, right now, for example, if there’s a deadline, and you and your in negotiation, and you’re conscious of doing nothing is is an option is one of the strategy that you’re adopting for your, for your negotiation. And then that, you know, that’s a conscious decision to do nothing, right. But doing nothing in the hope that the outcome will change is, is is not an option. So, you know, what I do is, when I when I need to do something, and it goes a couple of days, and there’s, you know, I tend to put it into my diary as a meeting. Yes. So, so, once it’s in the diaries and meeting, I know, I’ve got that window of time to actually do it. So, you know, other things, you know, life gets, gets gets ahead of us and stops us doing things otherwise. So you’ve got to put it in there as if you blocked the time to, to go and do this particular thing is just as if it was someone coming in and wanting a meeting with you. Yeah, yeah, now, I’ve just done that. I’ve literally started doing that. And, and it takes away the worry. And the stress I was I was talking to someone, he runs a online learning company called Lessonly. And he was sort of talking about the creative side of the brain versus the more sort of task orientated part of the brain and how the stress can kind of happen because you haven’t actually dealt with it. So it’s like you’re thinking about some of that you really got to do like what we’re saying. And if you put it at the moment, you put it in the diary and say, well, it’s okay. Don’t worry, I think it is it the left side of the brain a little right, I forgot. I don’t know, I think that’s preposterous, anyway, because I don’t think that it’s actually real, you know, there are all these people that talk about all sorts of things. And they don’t really know what enough there on about, but it just, it will, it gives you some sort of a relief once you say to yourself, okay, I really need to deal with this, or something really bad’s going to happen, and you you put it or something, you know, not really bad, but something bad, which is going to affect your life in the future. So it becomes really important got to share to them, you’ve got to put it in there. Yeah and I think that’s another way of taking that stress out. Because, you know, you have to deal with it. And you’re thinking, Oh, well, you know, I meant to do it this way morning, and I should have really done it, then I should really sticking it in as a in the diary, a as a specific action or meeting, what it does is, it takes your now then to remove it from your from your sort of thought list, right! So, you know, it’s in the diary, and you’re not going to forget it. And, you know, you’ve got the time allocated to it to resolve to deal with that issue. So your mind immediately freeze it up, right? When I, when I have things, you know, if I, if I’ve, if I’ve got a list of things to do, and I and some of it is delegation to certain people, once I delegate that it’s gone out of my mind. And one of the things I look for when I, when I recruit people is people I trust much more than, than people with skill sets, I can train a skill set, but trust is a difficult thing, right? So, so what I do, I make sure that if I tell someone, I have to complete trust in them, that they don’t either going to go off and do what we’ve we’ve agreed, or they’re going to come back to me at some point and say, I have not been able to do what we’ve agreed. So it comes back on my list if you know me, but what I can’t take is if I if we agree that someone’s going to do something, it comes off my list, it’s gone out of my mental state, and they don’t do it. So then, then, then I, then both of us got it out, you know, then then we’re, we’re sort of double counting the value of that task. And, and that’s not like, that can’t work for me, right? So I’d rather have someone with no skills that I can train than someone than someone that I can’t rely on to actually just just do that small thing of following through a telling me they can’t follow through. Yeah, yeah, hundred percent agree. So really, we’ve actually separated this out, because a lot of people come from it the other angle, they’ll say, well, get up earlier, do some exercise, eat the right food, meditate and all this. But actually, that is deferring the problem, isn’t it in many cases, or putting you in the right mindset to deal with the problem? It might certainly, you know, that all those things, I think would help your mindset, right. I mean, you know, cleaner, healthier, sort of living mind is always good. Yeah, but it but unless you actually know how to deal with issues, it’s giving you a it’s almost like putting glasses on a on a on a short sighted person. So now you can see the problem, but it unless you deal with the problem is still going to be a problem in front of them. It’s going to be clearer. Yeah, it’s kind of like just using feel good hormones to to delay handling what you need to deal with. Right? Yeah, yeah. And, and maybe we can use those feel good hormones to sort of put us in a better frame of mind is saying exactly what we spoke about earlier on, which is, I’m either going to do something to positively influence the future, which means that my likelihood of a negative result is lower all this I can do to achieve that, in which case done worry about it either. And then the feel good hormones should allow us to get to that clarity quicker. Yeah, it reminds me of your story. When you put all these executives, in the, in the sea water with sharks? Yeah, it certainly made them think clearer about, you know, about the issue. I was talking to my management team for some time, about, about merging with a big competitor of ours, and all the management team could see was the negatives of that they would see, you know, synergies means. You know, two people one job going forward. So, I’m going to lose my job, or, or, you know, I’m going to be subservient to someone else coming in, you know, what, how, why are we doing this, and, and it was, it’s driven by fear, right? And I took them shark diving with no pages, no nets, and they didn’t realize they were doing it until literally, the moment I asked them put their wetsuits on and get in the water. So, afterwards, the debrief was how did you feel when you realize what you’re about to do? And they, they said:- “Oh, my God, I hate you. And, you know, I can’t believe you’re making me do this, and I’m terrified.” And all this sort of stuff. And I said:- “Well, okay, how did you feel when you’re actually in there, and the shops were literally, you know, a yard a foot away from you. And they were like, 15-20 foot sharks. And then I said:- “How did you feel when you got out? So, you know, if you approach every challenging situation with that kind of mentality, then then you’ll get through it. You know, these things are very, it’s rare that if we worrying about something that much that we can sidestep it, yeah. So getting through it is the key. Yeah, yeah, yeah, I remember that. Yeah, yeah, I remember that one. That’s a really good one. I love Churchill. He was just amazing. So onto the onto the next, the next topic, commercial awareness might I know, you know so much about this, because you’ve, you’ve been, you’re involved with so many different businesses. So how do you start with commercial awareness? I mean, we all know about, like, the SWOT analysis is that where you would start. Depends on on the situation, really. But I mean, you know, again, if we try to sort of link this to sort of a work life integration, then, you know, a lot of life is about trying to create win wins between different entities, different parties, different people, and what you’re not looking to do, is, you’re not looking to, you know, win at the polarization cost of the, of the person or the, or the entity in front of you, you’re trying to say, you know, how do we, how do we both collaborate to, to make both of our worlds better? Okay, in French, so, between taker. So, in other words, it’s someone that links someone with a need, and someone with a solution together! And, this is what commercial awareness is, is, is trying to spot needs and trying to spot value. And, you know, if you look at technology today, we’ve got more technology than them, we know what to do with. Yeah, what’s missing is the creativity of application. So so where, where the real value proposition comes in, is, is not in the technology itself is not inventing stuff, per Se. It’s finding solutions for the inventions, finding solutions for the technology that are really, really useful. I have a business that I’m Chairman of called Ultrahaptics, which is a stunning technology, it’s about the sensation of touch using ultrasound in mid-air. model of their cars with no buttons in them. And you’d have a heads up display in front of you, and you put your hand out, and the button comes to you, and you feel the button in your hand, and you can turn things up, and you can turn things down by moving your hand around. And if you go over a bump, the button stays in your hand, because it’s actually following your hand. And the button you feel isn’t actually there. Right? Just basically just using your imagination, or your your, your understanding of the market and the other solutions, and what they can connect with what they can’t connect with, and then coming up with something that is going to help people, right. I mean, we’ve got to solve problems. Our generation, right? You will, my generation, those Two Millennial stroke Generation X is is we’ve grown up with the history of technology telling us that the way to progress is if I find a problem? How do I make that easier, faster, cheaper, more efficient? Nowadays, technology has the ability of saying, Well, how do I not need to do that again, right? And this is what we refer to as disruptive technology. Because instead of the efficiency process, that if that technology is as driven since the beginning of time, you know, the first the first farmer was, was dragging his own, you know, he was he was travelling to plant seeds, then he then he was digging Pharaoh’s with a kind of a plough, but he was pushing it by hand, then he decided to stick an ox in front of it. And then then tractors came along, and so on, and so forth, right, and then come by not, you know, so all of this thing, but it’s all about efficiency, efficiency, efficiency of doing the same thing much, much faster, easier, better, cheaper our days, it’s like, well, is there a way I just don’t need to do that. That’s, really interesting. I’ve never thought about it like that. It doesn’t take a lot to shut me up. That’s brilliant. So in the next in the next few years, you probably share the same view that there’s just so much coming at us, it’s almost like you need more awareness of what’s going on, but, but actually keeping up with, with what’s going on, it’s almost a full time job in itself. It is, I mean, you know, you’ve almost got to kind of look at things and go, you know, what, I’m going to have a bunch of people. So, you know, it’s, it’s super important that, that you have a, that you have a team around you. And I think this is why this is why diversity is extremely important, right? Because, you know, that the real reason for diversity is, is a positive reason, you know, when we look at, you know, what’s going on in the world in terms of employing a broad spectrum of ages, races, genders, that one of the real values of this is that the consumer dynamic is also that portfolio, right? And, we need people around us that are in tune with a way of looking at things that isn’t necessarily siloed to our own experiences. I mean, we’re all we’re all prejudice to an extent right now use that word very specifically with prejudice. Yeah, we are bites, right? So, and our bias comes from our gut feeling of what’s happened to us over our lives. So, you know, if you’re walking down the street and a bunch of footy who did use the are working towards you in a very sort of dodgy gate, and it’s sort of sunset and you probably think yourself, oh, my gut feeling tells me I should probably cross the road here. And, yet, you don’t know them from Adam, and they’ve not done anything wrong to you. So why would you take that that approach? Well, there’s something in your, in your, in your sort of education, educated DNA that tells you now, you know, what, what we have to be careful of is, is illogical, bias, right. But actually, you know, our background also tells us that, you know, we have a portfolio a diverse group of people has a more rounded view than a than a single person. And so, when we’re looking at businesses, you know, that that that ability to gather together a team which is very diverse, is so important to get different views of the same the same reality and get different views of the outside opportunity. Oh, yeah, very much so. But I think it’s, it’s actually quite difficult to find people who are, in minorities certainly, within you know, I mean, I’m working with an influencer project at the moment. And it’s very difficult to find sort of outwardly spoken females, for example. Yeah, and the proportion I mean, I looked at the proportion of the world’s billionaires and, and I looked at the list of the top hundred billionaires, and I looked at this list, and I tell you what, I reckon I could probably count the females on there, and one hand out of 100, and I was like, wow, and I wonder what that’s gonna look like, in the next 20-30 years? And if that is going to change, or is it not? I mean, I don’t know. I don’t know, Mike. Well, and I think that so again, something that I talked about in the book is, is, you know, I’m sure that it will change that the, you know, there’ll be more and more billionaires or the wealth of women will increase relative, and I’m sure that will happen, and it’s appropriate that it does. But I wonder, you know, so. So, again, Oliver James was was said something very interesting when I interviewed him. And he said, and it’s quite controversial, but he said, you know, is it is it? Is it that we’re getting a more balanced world? Or are women becoming more like men in business? Hmm. Which I’m not sure it’s the best solution, because I’m not sure that men actually are ideal, sort of, in their own right. I mean, if you, if you, if you look at the, the scarcity of, of women leaders in the world, you know, there’s probably a good reason why why the world is still a conflict everywhere. I think if if there were more women leaders, I would, I would imagine that the world would be a better place to live in. And so, you know, if we’re driving women to be more like men in business, I wonder if that’s the right way around. And maybe that’s maybe that’s a little controversial. But, you know, I think I think it’s worth it’s worth us sort of reflect on on whether we’re making tougher women out of business women, then when having, you know, a real compassionate value, which is what what I think they bring to the table on any board is, it is a very different sort of compassion that then the men can, I’d hate to see that, that disappear, sort of thing. I know what you mean, looking at the, the CEO of IBM, like Jenny, she’s amazing, like, she just her whole presence and, like, you know, what she’s done there is quite amazing, but it’s very, it’s very, it’s very weird to see, you know, very strong women in business, because it’s almost like they have to they have to be even even more tough, than men, is that what you’re Is that what you’re sort of saying? I think so. Yeah, I think that’s the I think that’s the that’s the thing, you know, that’s what I would like to try to avoid, I guess. And I don’t know whether that’s a short term thing that has to happen, you know, sometimes, you know, when we go through a sort of a process of trying to get from the pendulum drag that one all the way at one side, you know, it’s very hard to get that pendulum to swing down and stop in the middle it usually so the swings the other way first right settles in the middle, right, maybe we’re in that room, you know, that that secondary swing of the pendulum? Yeah, that is an inevitability. Before we we get a balanced view of life and, and identify whether that makes sense. But I’m a great believer in most things in life being being in this pendulum. So, you know, if you if you have things to out of kilter, one way, it’s highly unlikely they go back to the middle, you address them, because the effort needed to address them is so great that you get a reverse swing first before before the balance comes through. Makes a lot of sense. So what Yeah, and also, I mean, it’s about having, having the right number of people involved, and whatever, whatever commercially aware kind of research you’re doing, and actually just crunching the night was in the right way as well. I mean, talking to my Dad about representative samples the other day, and I think he got hired like, this was 20 years ago, he got hired by some government organization that will remain nameless to do some sort of, I don’t know, he did a workshop and he went in, and he explained to them about this, you know, representative sample, and it turned out that the research that they done was completely skewed because they actually didn’t allow for the number of variables. So from what he from what he explained, it’s having 1000 people from one particular with one particular variable, right, so this, this, this organization, they’ve only actually had 1000 people, but they had four variables. So they should have had a sample of 4000 instead of 1000. So, and he told them in this workshop, and they didn’t invite him back again. Yeah, but it’s like, you can’t you can’t hide away from the facts. Right, you know, exactly. Mike, it’s been a real pleasure. I want to thank you so much. And I will, I will let you know when this is live. Where do people find your book, Mike? So my book is on Amazon. Both books are on Amazon. It’s on Kindle version, audio book. First one is forget strategy, get results. It’s a little bit of a, an alternative view on leadership. 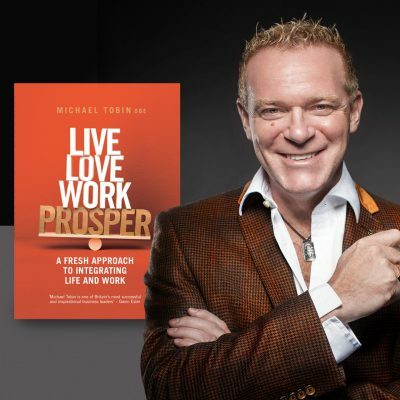 And the second one is live, love, work prosper, which is kind of a fresh, fresh approach to integrating life and work as opposed to trying to find a balance. Super, super well. Thank you. It’s been it’s been enlightening.